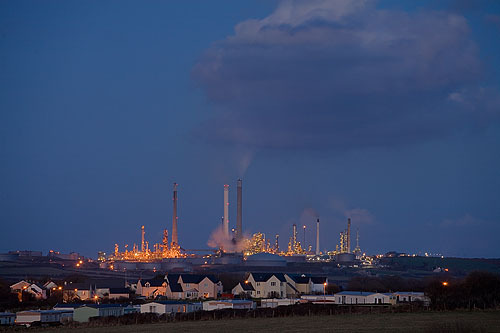 View of the Pembroke Oil Refinery (Rhoscrowther) from West Angle . The Milford Haven Area has 5 sites associated with the Oil Industry. As well as the 'Pembroke Oil Refinery' at Rhoscrowther built by Texaco (1964). BP (1961), built an Oil Storage facility and Pipeline at nearby Popton which closed in 1985. 3 refineries where also built on the north side of the Haven. Esso (1960) at the now South Hook LNG terminal . Amoco (1973) at the nearby 'Milford Haven Refinery' now operated by MURCO. Gulf (1968) at Waterston , now an LNG facility and Oil Storage Tanks.